Death is a threat for reporters who cover Pakistan’s spy agencies and their dealings with Islamist insurgents. In a speech given in Singapore on June 4, US Defense Secretary Robert Gates laid out plans for American military expansion in the Asian region and for heightened confrontation with China. His remarks, delivered at the 10th International Institute for Security Studies (IISS) Asia Security Summit, came amid rapidly rising tensions between China and other claimants to the South China Sea. The 10th IISS Asia Security Summit, known as the Shangri-La dialogue, took place from June 3 to 5. Previous years have seen military and diplomatic figures speaking on key regional issues at plenary sessions. Gates has attended the past five years and used his address last year to unequivocally warn China that “intimidation” of American oil corporations companies operating in the South China Sea would not be tolerated. This year the Chinese Defense Minister attended for the first time, and delivered an address to the summit as well. Regional tensions have mounted substantially since Gates’s speech last year, particularly over the disputed waters of the South China Sea. The waters are a vital shipping lane and the seabed contains large oil and gas deposits. The South China Sea is claimed in whole or in part by China, Taiwan, Vietnam, Malaysia, Brunei and the Philippines. The intensifying regional friction reflects the deepening confrontation between the US, whose global economic position has been in steady decline, and China. The past two weeks saw two confrontations. On May 26, Vietnam accused China of cutting the cables being laid by an oil exploration vessel belonging to the state-owned corporation PetroVietnam, which was conducting pre-drilling surveys on behalf of ExxonMobil and the Canadian oil company Talisman Energy. On May 31, the Philippines claimed that China had begun construction of new military facilities on unoccupied islands in the Spratly Island chain. It summoned the Chinese ambassador and denounced the construction as a “clear violation” of the 2002 ASEAN-China Declaration of Conduct in the South China Sea, which is an agreement for the shared use of disputed waters. Gates was the first plenary speaker at the security summit. His speech was a shot fired across the bows of China and call to regional allies to oppose Chinese expansion in the region. It laid out the agenda for an expanded US military presence in the Asia-Pacific region and warned sharply against underestimating the US military commitment to the region. The US has a vital national interest, Gates asserted, in freedom of navigation. While the American military was already stretched thin by two ongoing wars in Iraq and Afghanistan, it would engage in “key modernization programs [which] would address one of the principal security challenges we see growing over the horizon: The prospect that new and disruptive technologies and weapons could be employed to deny US forces access to key sea routes and lines of communication.” This vow was obviously directed at Beijing. US diplomats and military officials have repeatedly leveled the charge against China that it is seeking to control the flow of commerce and sea traffic in the South China Sea. Gates’s words, on the other hand, were sharply confrontational throughout. He had concluded his comments by declaring “history’s dustbin is littered with dictators and aggressors who underestimated America’s resilience, will and underlying power.” This was a threat, not even thinly disguised, to China. During an interview prior to the summit, Gates stated: “The Chinese have learned a powerful lesson from the Soviet experience, and they do not intend to try and compete with us across the full range of military capabilities. But I think they are intending to build capabilities that give them a considerable freedom of action in Asia, and the opportunity to extend their influence.” As his speech made clear, the US intends to respond no less aggressively to China than it did to the Soviet Union. As other summit speeches demonstrated, however, more than active maneuvering is taking place. Encouraged by US support, the Vietnamese and Philippine defense ministers spoke sharply and pointedly about recent events in the South China Sea. The words of Philippine Defense Secretary General Voltaire Gazmin were even stronger. The actions of China had caused the Philippines “worry and concern,” he declared. Private business firms conducting resource exploration, i.e., oil drilling, were threatened. Gazmin denounced the construction of structures on the disputed islands. What he did not mention was that Philippine President Aquino announced just three months ago, after US prodding, that he would begin construction of military installations on precisely these disputed islands. The Chinese construction has simply pre-empted what the Philippines was preparing to do. Vietnam, the Philippines and other ASEAN members are playing a dangerous balancing game: while economically dependent on China, which is for many their largest trading partner, they are encouraging a greater US military presence as a means of asserting their own interests against Beijing. The result of the Obama administration’s aggressive intervention into South East Asia is a marked rise of regional tensions and the potential for military confrontations and clashes. wow and broader still we go?? The Foreign Ministry of Bangladesh disclosed on September 26 that the United States had requested combat troops for the North Atlantic Treaty Organization’s military command in Afghanistan. The effort to recruit Bangladeshi soldiers for the nine-year-old war was made in an overture by U.S. Special Representative for Afghanistan and Pakistan Richard Holbrooke to Bangladesh’s Foreign Minister Dipu Moni in New York City, presumably on the sidelines of or following last week’s United Nations General Assembly session. Should the government of Bangladesh accede to the American request, it would become the 48th official Troop Contributing Nation for NATO’s International Security Assistance Force (ISAF) and the seventh Asia-Pacific nation to provide troops to the North Atlantic military alliance for its war in South Asia, one which has further advanced across Afghanistan’s eastern border into Pakistan with marked ferocity during the past five days. NATO will have gained another major ally in the building of its Asian complement using the Afghan-Pakistani war theater as the grounds for integrating the armed forces of countries on the other side of the world from the North Atlantic for what is expanding into a global U.S.-led military network. Bangladesh’s combat forces would join military units from Malaysia, Mongolia, Singapore, South Korea, Australia and New Zealand among Asia-Pacific countries, with a report that a 275-troop marine contingent from Tonga is also to arrive in Afghanistan soon. Japan has personnel assigned to NATO’s Provincial Reconstruction Teams in the country and in the past has supplied the U.S. with naval assistance for the war effort. The inclusion of Bangladesh into the ranks of NATO’s ISAF, however, would constitute a milestone in two key ways. It would be the only country in South Asia with troops in the war zone aside from the two nations in which the expanding conflict is being fought: Afghanistan and Pakistan. And Bangladesh would be the second most populous state contributing to NATO’s military campaign, only surpassed by the U.S., as it has the seventh largest population in the world at 160 million. The war in Afghanistan has provided the Pentagon and NATO the groundwork for working with the militaries of scores of nations under real world and real time combat conditions. Every European country except Belarus, Cyprus, Malta, Moldova, Russia and Serbia has deployed troops to Afghanistan under NATO command, as have the nations of the South Caucasus: Armenia, Azerbaijan and Georgia. The United Arab Emirates is the first Persian Gulf state to do so. Though not yet official contributing nations, several other countries have personnel in Afghanistan or on the way, including Bahrain, Colombia, Egypt and Japan. Over a quarter of the world’s nations have supplied military contingents for the North Atlantic bloc’s war in Afghanistan. In the past year both the U.S. and NATO have intensified activities aimed at integrating Bangladesh into the West’s military nexus, both in preparation for the deployment of its troops to Afghanistan and for solidifying what for the past decade has been referred to as Asian NATO. This May 12 a roundtable meeting was held in the capital of Bangladesh entitled "The Role of NATO in the New Security Order" with the participation of several "experts, military personnel and former government officials from the region." The title of the event suggests it was conducted in the context of last year’s discussions of the new NATO Strategic Concept held in several European and North American nations. The Indian subcontinent is far-removed from the North Atlantic Alliance’s point of origin, but the new doctrine to be adopted this November at NATO’s summit in Portugal will institutionalize the bloc’s expansion into an international military and – to use its own term – security organization. The keynote address was delivered by former Norwegian defense minister Anders Christian Sjaastad and the roundtable as a whole "discuss[ed] the present and possible role of NATO in [the] new security order…." A local newspaper account of the meeting reported that "Speakers at a roundtable here…said the greatest evolution taken place in NATO over the past 20 years was its transition from a static, defensive force to a force ready to take on security missions well beyond its traditional Trans-Atlantic borders." Whether fully cognizant of it at the time or not, Sjaastad spoke volumes regarding NATO’s 21st century plans in stating that Asia "is where the action is nowadays. Europe, in comparison, is rather dull….All the global conflicts originated from this part of the world." Whether regarding the recent or remote past, his claim that all global conflicts originated from Asia is an absurd contention, but is indicative of NATO’s determination to pacify and subjugate "unruly" parts of the non-Euro-Atlantic world. The opening remarks were made by retired Major General ANM Muniruzzaman, the founder and president of the Bangladesh Institute of Peace and Security Studies which sponsored the event, who "spoke of the eastward expansion of NATO, saying that the institution has undergone a sea change. The New NATO had a fresh strategic concept and was expanding beyond its original Eurocentric perimeters." That is, Europe has been united under NATO control and now it is time to move on Asia. "NATO instead of doing policing is protecting its own security and posing a threat to others. And why are you in Afghanistan? It is not just because of Al Qaeda and the Taliban. It is also because of the oil in the region. You want to 'tame’ Pakistan, Iran. All this has other motives. NATO only comes with its own interests at heart." The former general evidently remembered which side the U.S. and its NATO allies were on during his country’s 1971 war of independence. Since late last year the Pentagon has demonstrably increased efforts to pull the armed forces of Bangladesh into its geopolitical orbit. In early November three U.S. military commanders visited Bangladesh. Theirs were names to conjure with: Lieutenant General Benjamin Mixon, Commanding General of United States Army Pacific and former commander of the Multi-National Division North in Iraq. Vice Admiral John Bird, commander of the U.S. Seventh Fleet, the largest forward-deployed fleet in the world. U.S. Marine Corps Major General Randolph Alles, Director for Strategic Planning and Policy at the U.S. Pacific Command, the largest overseas military command in the world. Also in early November the U.S. led the first of four Tiger Shark military exercises held in the nation. The latest, Tiger Shark-4, ended on September 26. At the close of the first, U.S. Ambassador James F. Moriarty attended a graduation ceremony for 59 navy commandos at the Bangladesh Navy Special Warfare and Diving Salvage Centre at the BNS (Bangladesh Naval Ship) Issa Khan Naval Base in Chittagong. "The commandos received specialised training during the US-Bangladesh 'Tiger Shark’ exercise" that ended on November 13. According to the American envoy, "The United States Government will continue to assist the Government of Bangladesh in developing this professional, elite force. After employing NATO to subjugate Europe, launching U.S. Africa Command to gain military dominance over the 54-nation continent, and occupying and pacifying most of the Middle East, the Pentagon is concentrating on Asia and increasingly on South Asia. Pakistan’s government filed an official protest with the United States today following a cross-border attack by NATO warplanes from Afghanistan against a military post in Mohmand Agency. Pakistan said two jets had crossed the border into Pakistani airspace and that they had dropped six bombs on the military post, which lies just a mile and a half from the border with Afghanistan. No deaths were reported. The Foreign Ministry termed the attack a "serious concern" and called for the US to assist in a "joint inquiry" of how the attack happened. NATO has yet to comment on the attack. The attack comes just a day after Afghan militants crossed the border against the nearby Bajaur Agency, attacking three villages. Though NATO had often complained about Pakistan’s lack of control over the tribal area, increasingly it is cross-border attacks from both NATO and the militants coming into Pakistan, not the other way around. In a sign of deteriorating relations between Pakistan and Britain, the Pakistani Government have sent home around 18 British military officers who had been leading a training program for Pakistan’s Frontier Corps. The Government has become increasingly weary of Western operations in the region following the extremely dubious assassination of Osama Bin Laden, who according to Western governments had been hiding in Abbottabad, Pakistan, possibly with knowledge of Pakistan officials. Although there is no evidence of Bin Laden’s death, Pakistan has still been put in a difficult position on the world stage, essentially being accused of working in cahoots with Al Qaeda. It’s only logical that they want the Western empire out. Around a hundred US trainers have already been given their marching orders. Pakistan's defense minister has ordered the United States to leave a remote desert airbase in the country's southwestern Balochistan province. Chaudhary Ahmed Mukhtar says Shamsi secret airbase is reportedly being used for unmanned drone attacks and will soon be passed onto the Pakistani army. "We have told them (US officials) to leave the air base," Mukhtar told a group of reporters in Islamabad on Wednesday. The Central Intelligence Agency (CIA) has been using the airbase to station its unmanned predator drones. The strategic location of the base allows US forces to launch the unauthorized drone attacks within minutes of an order. 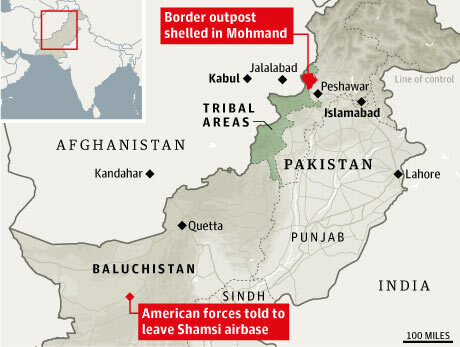 An investigation by The Times revealed in 2010 that the CIA has been secretly using Shamsi to launch strikes on targets on the Pakistani side of the border with Afghanistan. The drones have been used to attack targets inside Pakistan's tribal areas killing several hundred innocent civilians. The base was also extensively used in 2001 when the US-led invasion of Afghanistan began. The Pakistani military had reportedly allowed the US to use Shamsi, Jacobabad, and two other bases - Pasni and Dalbadin - in its 2001 invasion of Afghanistan. The then military government, led by Pervez Musharraf, said the Americans had left the bases in 2006. Relations between Islamabad and Washington have been tense amid repeated breach of Pakistani sovereignty by US forces. Pakistani lawmakers have recently passed a resolution condemning the US raid inside Pakistan that allegedly killed al-Qaeda leader Osama bin Laden in early May. They have demanded that the government of President Asif Ali Zardari review its ties with the US and other Western countries. Pakistan has also called on the United States to steeply reduce the number of CIA operatives and halt the non-UN-sanctioned drone attacks on its soil. Meanwhile, reports say US President Barack Obama has rejected Islamabad's call for more transparency regarding CIA operations in the country. Mukhtar also said that Pakistan has made many sacrifices in the war against terrorism while payments from the coalition support fund have stalled. His order to vacate the base comes shortly after he announced Pakistan is reviewing relations with the US in the so-called war on terror. KASHGAR, Aug. 1 (Xinhua) -- A group of religious extremists led by militants trained in overseas terrorist camps was behind the weekend attack on civilians in China's far-western Xinjiang Uygur Autonomous Region that left 6 dead and 15 others wounded, the local government said Monday. The initial probe found that the group's leaders had learned how to make explosives and firearms in overseas camps of the terrorist group "East Turkistan Islamic Movement" (ETIM) in Pakistan before entering Xinjiang to organize terrorist activities, the government of Kashgar City said in an online statement. Six civilians were killed, 15 others -- including three policemen -- were injured after attackers set fire to a restaurant and started randomly killing civilians in Kashgar on Sunday. Five suspects were shot dead by police. The government on Monday also issued arrest warrants for two suspects who fled the scene. The two have been identified as 29-year-old Memtieli Tiliwaldi and 34-year-old Turson Hasan. Both are local ethnic Uygurs, according to the warrants. The police have offered 100,000 yuan (15,384 U.S. dollars) for information which could lead to their arrests. Pan Zhiping, a researcher with the Central Asia Studies Institute under the Xinjiang Academy of Social Sciences, called the ETIM "the most violent and dangerous" among the "East Turkistan" separatist forces. He said the organization is based somewhere along the Afghanistan-Pakistan border. The ETIM traditionally trains its members for suicide bombings and car bombings before sending them to Xinjiang. But today more are using the Internet to penetrate the border to spread bomb-making techniques, Pan and other long-time Xinjiang observers said. The United Nations and the Chinese government have labeled the ETIM an international terrorist organization. The Sunday attack was the second violent case in Kashgar over the weekend. On Saturday night, two people hijacked a truck after killing the driver and drove it into crowded street. The suspects then jumped out of the truck and hacked bystanders randomly. Eight civilians were killed while 27 others were injured. One of the suspects was killed in the clash while the other was apprehended. The local government did not specifically label Saturday's attack as an act of terrorism. Zhang Chunxian, secretary of Xinjiang regional committee of the Communist Party of China (CPC), has ordered a crackdown on terrorist attacks, religious extremist forces, and illegal religious activities at an emergency meeting held in the regional capital Urumqi following the attacks. Zhang also ordered strengthened management of explosives. He said the violent attacks would greatly damage the region's stability. "People in Xinjiang should stay vigilant and recognize that terrorist attackers are the 'common enemies of all ethnic groups,'" Zhang said. Xinjiang -- with 41.5 percent of its population Uygurs, a largely Muslim Chinese ethnic group -- is China's frontline against terrorism. The region borders eight central and western Asian countries, many of which have been attacked by terrorist and extremist militant groups. Fourteen people were killed in two attacks at the weekend in the ancient Silk Road city of Kashgar, and five alleged attackers were in turn shot dead by police in the wave of violence. The Kashgar authorities said in a statement on their website that initial investigations found that the perpetrators of one attack learned explosive-making skills in terrorist-run camps in Pakistan. "The heads of the group had learned skills of making explosives and firearms in overseas camps of the terrorist group East Turkistan Islamic Movement in Pakistan before entering Xinjiang," the online statement said. Remote Xinjiang has seen several outbreaks of ethnic violence in recent years as the mainly Muslim Uighur minority bridles under what it sees as government oppression and the unwanted immigration of ethnic Han Chinese. Last month, more than 20 people were killed in a clash with police in the remote city of Hotan. Monday's statement appeared to refer only to an on a restaurant in Kashgar that took place on Sunday. That came less than 24 hours after an earlier incident in which a truck that was waiting at a light at the food market in Kashgar, not far from the border with Kyrgyzstan, was reportedly hijacked. Tianshannet.com, a website run by the regional government, reported that the attackers killed the driver, ploughed the vehicle into passers-by on a nearby pavement, then got out of the truck and stabbed people at random. Six bystanders were killed before the crowd turned on them and killed one attacker, the report said. Many Uighurs are unhappy with what they say has been decades of political and religious repression, and the unwanted immigration of China's dominant Han ethnic group. While standards of living have improved, Uighurs complain that most of the gains go to the Han. This tension has triggered sporadic bouts of violence in Xinjiang -- a vast, arid but resource-rich region which is home to more than eight million Turkic-speaking Uighurs. State media quoted an official in Xinjiang calling the Hotan clash in July a "terrorist" attack. But Uighur activists called it an outburst of anger by ordinary Uighurs and said security forces killed 20 people during the unrest. In the nation's worst ethnic violence in decades, Uighurs savagely attacked Han Chinese in the regional capital Urumqi in July 2009 -- an incident that led to retaliatory attacks by Han on Uighurs several days later. The government says around 200 people were killed and 1,700 injured in the violence, which cast doubt on the authoritarian Communist Party's claims of harmony among the country's dozens of ethnic groups. The Pakistani Taliban has claimed responsibility for a pair a suicide bomb attacks targeting the house of a top Pakistani security officer Wednesday, that killed at least 22 people including the officer's wife. Police said the first attacker detonated his vehicle outside the residence of the deputy head of Pakistan's paramilitary Frontier Corps in the southwestern city of Quetta. After that blast, a second bomber on foot stormed the officer's house and detonated his explosives. The house was badly damaged in the attack, and the blasts wounded more than 60 people. Pakistan's paramilitary force has been very active in the fight against the country's domestic Taliban group throughout the country's northwest, including the tribal regions bordering Afghanistan. Earlier this week, the paramilitary force took part in an operation with the U.S. and Pakistani spy agencies in Quetta to capture suspected senior al-Qaida operatives. Pakistanis have held a mass protest to condemn US assassination drone strikes, saying the attacks kill more civilians than terrorists, Press TVreports. Some 2,000 people and activists from Pakistan Tehreek-e-Insaf gathered in front of the parliament building in Islamabad on Friday to voice their outrage at the non-UN-sanctioned strikes. They said the attacks on the tribal region on Pakistan’s northwestern border with Afghanistan kill more civilians than Taliban or al-Qaeda terrorists. Protesters called on Pakistani lawmakers to pass a resolution to put an end to the deadly assassination attacks by CIA agents in the country’s northwestern tribal belt. This is while, Pakistani tribal elders have met in the capital to unanimously vote for a resolution urging Islamabad to take immediate action to stop the killings of civilians by US drones. An assembly of tribal elders (jirga) also demanded the International Court of Law to take action against US President Barack Obama’s administration for not halting CIA-run operations on the Pakistani soil. “We have run slides on the screens, showing images of innocent women and children to the participants of the jirga, and proved that the US is killing civilians under the pretext of hunting militants,” Kamran Khan, a deputy from North Waziristan said after the tribal meeting. “We are united against the US atrocities and will fight against American terrorism,” said Adeel Khan, a local elder from South Waziristan. Civilians have been the major victims of US assassination drone attacks, carried out regularly against Pakistan’s North and South Waziristan tribal regions. Washington says the strikes are aimed at targeting anti-US and pro-Taliban militants, but Pakistani officials say civilians are the main victims of the unauthorized attacks. 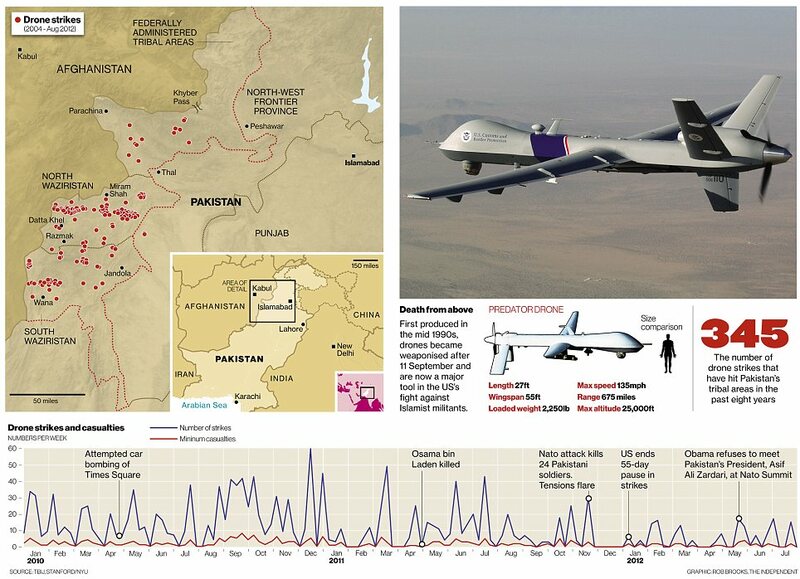 Aerial attacks by the US remote-controlled aircraft have killed hundreds of people in the volatile regions over the past years. The operation, initiated by former US President George W. Bush, has escalated under incumbent Obama. The UN has condemned the US use of combat drones against other countries as a blatant violation of international law. Philip Alston, UN special envoy on extrajudicial killings, said in a report in late October 2010 that the attacks were undermining the rules designed to protect the right of life. Alston also said he feared that the drone killings by the US Central Intelligence Agency could develop a “playstation” mentality. PESHAWAR, Pakistan – U.S. drone-fired missiles hit a house in Pakistan's northwest tribal region near the Afghan border Wednesday, killing eight people, Pakistani intelligence officials said. U.S. Secretary of State Hillary Clinton has threatened Pakistan with sanctions if the country continues with plans to build a natural gas pipeline to Iran. The U.S. is moving to squeeze Iran financially in a bid to force it to drop its nuclear program. But Pakistan has been unwilling to line up behind the U.S., saying it needs Iran, a neighbor, to help it meet a massive energy shortage. Mrs. Clinton told a U.S. House of Representatives subcommittee Wednesday that sanctions could be triggered if Islamabad presses ahead. As Pakistan’s economy already is in dire straits, the sanctions could be “particularly damaging” and “further undermine their economic status,” Mrs. Clinton said. Pakistan’s top bureaucrat in the Petroleum and Natural Resources Ministry, Muhammad Ejaz Chaudhry, said the pipeline was crucial for Pakistan’s energy security – the longstanding Pakistan position. But he added that Pakistan was “committed not to create any problems.” A spokesman for the Foreign Ministry was not immediately available to comment. “Pakistan has announced that the multi-billion-dollar gas pipeline deal with Iran is still on, despite the US pressure,” Iran’s official Islamic Republic News Agency said in a report Thursday. Tehran says its nuclear program is for peaceful purposes. The pressure on Pakistan comes as the U.S. is calling on India, China and Turkey to reduce their imports of Iranian crude oil. Mrs. Clinton said earlier this week the U.S. was having “very intense and very blunt” conversations with the three countries on the issue. The U.S. also has been disrupting financial networks that Tehran relies on to get foreign currency for its oil sales. The pressure appears to be having some success. The European Union agreed in January to ban Iranian oil imports from July 1. India has stood firm in public, saying it needs Iranian oil. But Indian news reports say the country has quietly been seeking increased oil supplies from Saudi Arabia and Iraq in a bid to wean itself off Iranian supply. The threat to Pakistan comes amid very poor relations between Islamabad and Washington. The two nations are ostensibly allies in the war against the Taliban. But the U.S. blames Pakistan for continuing to support some elements of the Taliban, a charge Pakistan denies. Military and civilian officials in Pakistan were vexed by the U.S. decision in 2005 to enhance civilian nuclear cooperation with India, while denying a similar deal to them. Pakistan is building civilian nuclear reactors with China’s help but says it needs to do more to ensure its energy security. Work on the Pakistan-Iran pipeline, which is to link Iran’s South Pars gas field with Pakistan’s Baluchistan and Sindh provinces, has not yet begun. An earlier plan to extend the pipeline through to India, at a total cost of $7 billion, was dropped after New Delhi pulled out under pressure from the U.S. The current project is valued at $1.5 billion and is scheduled for completion by 2014, Mr. Chaudhry said. Once operations begin, Iran has committed to supply 750 million cubic feet of gas per day for 25 years. Pakistan relies on gas for half its energy needs but domestic supplies are declining, forcing the country to rely on imports. The gas shortages have contributed to an energy shortfall which means most parts of the country suffer lengthy blackouts on a daily basis. Pakistan is not shying away from a fight with the U.S. over Washington’s threat of sanctions if Islamabad continues to push ahead with plans for a gas pipeline to Iran. On Wednesday, Secretary of State Hillary Clinton threatened sanctions if Pakistan goes ahead with the $1.5 billion pipeline, a project which Washington views as undermining its attempts to squeeze Iran to drop its nuclear program. The next day, Pakistan Foreign Minister Hina Rabbani Khar hit back hard. For an illustration of the current low-point in U.S.-Pakistan relations, take a look at the row over a bill submitted by a U.S. congressman over Baluchistan, a conflict-ridden Pakistani state. And there it might have sunk without notice, like many bills that are put before Congress. 'These strikes are becoming much more common,' Mirza Shahzad Akbar, a Pakistani lawyer who represents victims of drone strikes, told The Independent. The study is the product of nine months' research and more than 130 interviews, it is one of the most exhaustive attempts by academics to understand – and evaluate – Washington's drone wars. Despite assurances the attacks are 'surgical', researchers found barely two per cent of their victims are known militants and that the idea that the strikes make the world a safer place for the U.S. is 'ambiguous at best'. Washington says the drone program is vital to combating militants that threaten the U.S. and who use Pakistan's tribal regions as a safe haven. Pakistan wants the drone strikes stopped - or it wants to control the drones directly - something the U.S. refuses. Reapers and Predators are now active over the skies of Somalia and Yemen as well as Pakistan and - less covertly - Afghanistan. ISLAMABAD -- The Pakistani government has the right to shoot down U.S. drones if Washington ignores warnings to halt the "illegal" aerial attacks, a Pakistani court ruled Thursday. "The government of Pakistan and its security forces shall ensure that in future such drone strikes are not conducted and carried out within the sovereign territory of Pakistan," said a two-judge panel led by Peshawar High Court Chief Justice Dost Muhammad Khan. Khan said in the 22-page judgement that the drone attacks carried out against "a handful of alleged militants who are not engaged in combat with the U.S. authorities or forces" breached international laws so they were "absolutely illegal and blatant violations" of national sovereignty. The court also declared the drone strikes "a war crime" and directed the Pakistani government to request the United Nations form a tribunal to investigate and render a final verdict on whether the airstrikes constitute war crimes. The judgment decided a set of identical petitions challenging the drone campaign against Islamist militants entrenched in Pakistan's tribal region bordering Afghanistan. The judges said the United States committed a "serial killing" of civilians in the North and South Waziristan tribal districts that began in 2008. They cited the local administration as saying 1,449 civilians had been killed and 335 critically injured through the end of 2012. "The civilian casualties ... [are] an uncondonable crime on the part of U.S. authorities, including the CIA, and it is held so," said the judgment, which described President Barack Obama, the Pentagon and Central Intelligence Agency as the "decision-making troika" behind the drone campaign. Mirza Shahzad Akbar, a human rights activist and one of the lawyers for the victims of drone attacks, described the verdict as a landmark. The Pakistan government's previous statements that the drone strikes are illegal were considered just an opinion, but now the same judgement has been handed down from a court, making the case much stronger, he said. "If even now the drone strikes continue, at least we will have the right to approach the judiciary, and the court itself has the inherent jurisdiction to prosecute the federal government, prime minister or the president for contempt," Akbar said. Pakistan publicly condemns the drone campaign, describing it as illegal and counterproductive to its own fight against militants, but many analysts and observers said they believe the strikes are carried out with Islamabad's tacit approval. Last month, Pakistan's former military strongman Pervez Musharraf told the U.S. broadcaster CNN that his country secretly approved a few U.S. drone strikes. No definitive death toll from the strikes is available, but hundreds of Islamist rebels as well as civilians have been reported killed since the first U.S. drone strike in 2004. President Obama and Jay Leno trade jokes about drones at the 2010 White House Correspondents' Association Dinner in Washington, D.C.
Two suicide bombers have attacked a church in northwest Pakistan, killing at least 50 people including 4 children, local officials told AP. Eyewitnesses said around 600 people had gathered for Sunday mass in the church. Commissioner Sahibzada Anees said that over 70 people were injured in the twin blasts in the Kohati Gate district of the city of Peshawar. The attackers detonated their explosives as worshippers filed out of a Sunday prayer service. "Six hundred people were inside the church when the blast took place," deputy commissioner Zaheerul Islam told Pakistan's private Geo TV. Previous terrorist attacks on Pakistan’s Christian minority have been blamed on hardline Islamist groups.So far no one has come forward to claim responsibility for the attack. A drone victim, journalist and activist who has spoken out against drone strikes in Pakistan was kidnapped by fifteen to twenty men in the early hours of February 5. He is missing and a judge in Pakistan has ordered the Pakistani intelligence services to produce him by February 20. Kareem Khan has been pushing a legal case against the CIA and Pakistan government, seeking to hold them accountable for the killing of his son and brother in December 2009. He submitted a complaint against former CIA station chief in Pakistan, Jonathan Banks, for his alleged role in the drone attack that left his family dead. His application to register the case against Banks, according to Channel 4 News, said: “Jonathan Banks is operating from the US embassy in Islamabad which is a clear violation of diplomatic norms and laws, as a foreign mission cannot be used for any criminal activity within a sovereign state.” Khan alleged that Banks had a “business visa,” which meant he did not have “diplomatic status” and was not immune from prosecution. Khan’s brother-in-law, Dilbar Jan, filed a report on his disappearance with police. Jan told Agence France-Presse, “The kids, my sister, my uncle and I are all very worried and anxious.” He was taken by fifteen to twenty people, some dressed in police uniforms. His young nephews and him saw the kidnapping. Akbar was at a hearing in the Rawalpindi Bench of the Lahore High Court to convince the court to help him figure out where Khan is being held. It is believed the intelligence services must have Khan because the police claim to know nothing about his abduction. The Ministry of Interior now has a week to find Khan and bring him before the court. Karim is the first, that I know of, that has been picked up who is an anti-drone activist, but disappearances in Pakistan are very common. It’s a common state tactic. It has been happening in Balochistan, where there is a separatist movement, for a long time now. And, in fact, three are families protesting. There were mass graves found in Balochistan of missing people quite recently, only a few weeks ago. So this is a very common tactic by the state, and now, clearly, the Pakistani establishment, which is to say the intelligence agencies and the Pakistani army, want to send a message to the anti-drone movement to tell us to—you know, to tell the movement to shut up, basically. A page on the “Wounds of Waziristan” website has been dedicated to Khan, with a call to people around the world to engage in a “Twitter Storm” with the hashtag #FreeKareem to hopefully get authorities to find him and have him freed. Activists from the peace group, CODEPINK, are holding a demonstration outside the Pakistani embassy in Washington, DC, this afternoon. While it is unclear at the moment what role the United States might have played in Khan’s disappearance—or, more specifically, what role the CIA may have played, it should not go unmentioned that US intelligence agencies have sought to neutralize drone opponents. Akbar was not granted a visa by the State Department to visit the US when he wanted to come and help translate testimony from Pakistani drone victims scheduled to testify to members of Congress. Drone opponents are viewed as individuals participating in a “propaganda” campaign against the US. Their success in turning people against drones is seen as detrimental to the ability of the US to wage the so-called war on terrorism effectively. There is no evidence at the moment that suggests the US or, specifically, the CIA kidnapped Khan. But let’s admit the record of the US does not allay suspicion. It is certainly reasonable to suspect that the US government has some idea where Khan happens to be and, if they cared about his abduction, the government could apply pressure to have him freed. But, since he is probably viewed as a threat to continued operations in Pakistan—operations which the Pakistan government has at least publicly displayed clear opposition and a court has even decided constitute war crimes—what can Khan’s family reasonably expect the US government to do for them? '....ZAKARIA: Do you think we should be thinking of al Qaeda as a terrorist group? I know that there was a conference in January 2001, which you attended, at which you felt that bin Laden was better described as a religious warrior, and should not actually be thought of as a terrorist. GUL: No. We said, unless the evidence is brought up against him, then he is not a terrorist. It's wrong. 9/11's full evidence has still not emerged. It is still shrouded in mystery. A lot of people have a lot of misgivings about that. And it's not only me. I think a lot of people in America would be thinking the same way. There are scientists, there are scholars, who have written articles on it. So, I think to dub a man as terrorist - because I know, I heard him twice say on radio, or something like that, and I think it was Osama - not only that, but Mullah Omar also said that he did not believe that Osama had carried out that act. So, that is still a mystery, and it needs to be resolved. Americans have still to set up a proper commission, an inquiry commission, into this event. I think that's very important. And I think President-designate Obama would do well to set up an inquiry commission into this. ZAKARIA: What is your hunch as to who did - who perpetrated the 9/11 attacks? GUL: Well, I have been on record, and I said it is the Zionists or (ph) the neocons. They have done it. It was an inside job. And they wanted to go on the world conquerors. They were looking upon it as an opportunity window, when the Muslim world was lying prostrate. Russia was nowhere in sight. China was still not an economic giant that is has turned out to be. And they thought that this was a good time to go and fill (ph) those strategic areas, which are still lying without any American presence. And, of course, to control the energy tap of the world. GUL: That's what I also think, yes. ZAKARIA: Who is at the heart of - who do you think was at the heart of plotting 9/11? GUL: At the - it's very difficult, really. I wouldn't point my finger at it. But I think it was planned in America. And at least one knows that it was done in Germany, as far as the reports go. But I think the heart of planning was inside America, because the job was done there. But not a single person so far has been captured, caught, interrogated inside America, even though this entire episode took place there. ZAKARIA: But you've said that the people behind it were the Zionists, neocon conspiracy. Do you mean by that American Jews? Do you mean Israel? GUL: No Israel. I will not - because Jews are also divided into - not all Jews are bad. Of course, there are a lot of things common between Jews and Muslims. In fact, they are the closest to us religion-wise, because some of their scriptures are respected by us. Their prophets are our prophets. They have the injunctions in Torah are very much similar to injunctions in the Holy Quran. So, there are things which are very common. But there are those people who are very ambitious, who have a certain agenda of their own. And I think they have turned the world upside-down, because of those ambitions or their fears. The operator told the Bureau of Investigative Journalism: "The UK has been asked for to pull back some from its availability bolster bundles on a brief start by the Pakistan government in perspective of security concerns."